In this lesson, we will learn how to find the equation of a straight line in parametric form using a point on the line and the vector direction of the line. Find the parametric equations of the straight line that passes through the point ( − 9 , 8 ) with direction vector ( 4 , − 7 ) . Find the parametric equations of the straight line that makes an angle of 1 3 5 ∘ with the positive 𝑥 -axis and passes through the point ( 1 , − 1 5 ) . Consider the line shown that passes through the point ( 3 , 4 ) and makes an angle of 45 degrees with the positive 𝑥 -axis. Suppose that the distance between ( 3 , 4 ) and any point ( 𝑥 , 𝑦 ) on the line is 𝑟 . Write, in terms of 𝑟 , an expression for the horizontal distance 𝑥 − 3 between the two points. Write, in terms of 𝑟 , an expression for the vertical distance 𝑦 − 4 between the two points. 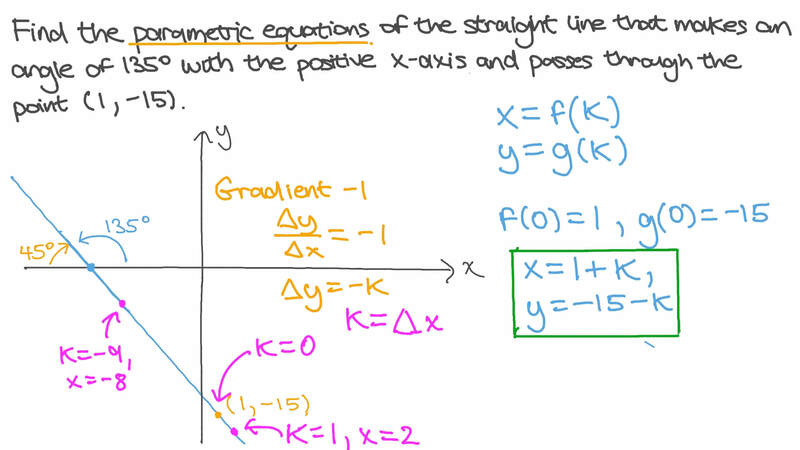 Hence, write a pair of parametric equations which describe the line. Find the coordinates of the point on the line which is at a distance of 4 from ( 3 , 4 ) . Write a pair of parametric equations with parameter 𝑟 describing the shown line. Write the parametric equation of the straight line that passes through the point ( 𝑎 , 𝑏 ) and makes an angle of 𝜃 with the positive 𝑥 -axis as shown. The equations 𝑥 = 2 𝑡 + 1 , 𝑦 = − 3 𝑡 + 2 parameterize the line segment between ( 1 , 2 ) and ( 3 , − 1 ) over the interval 0 ≤ 𝑡 ≤ 1 . Which of the following is a parameterization of the line segment on − 1 ≤ 𝑡 ≤ 0 ? Which of the following is a parameterization of the line segment on 0 ≤ 𝑡 ≤ 1 that starts at ( 3 , − 1 ) and ends at ( 1 , 2 ) ? Which of the following is a parameterization of the line segment on 0 ≤ 𝑡 ≤ 2 ? If the parameterizations you have given above correspond to a particle moving along the line segment, how does the parameterization over interval 0 ≤ 𝑡 ≤ 2 relate to the one over 0 ≤ 𝑡 ≤ 1 ? AOver 0 ≤ 𝑡 ≤ 2 , the particle is moving half as fast as over 0 ≤ 𝑡 ≤ 1 . BOver 0 ≤ 𝑡 ≤ 2 , the particle is moving twice as fast as over 0 ≤ 𝑡 ≤ 1 . COver 0 ≤ 𝑡 ≤ 2 , the particle is moving three times as fast as over 0 ≤ 𝑡 ≤ 1 . DOver 0 ≤ 𝑡 ≤ 2 , the particle is moving one-third as fast as over 0 ≤ 𝑡 ≤ 1 . Consider the points 𝐴 , 𝐵 , and 𝐶 and the line segments in the figure. Give the parameterization of 𝐴 𝐵 over the interval 1 ≤ 𝑡 ≤ 3 . Give the parameterization of 𝐵 𝐶 over the interval 3 ≤ 𝑡 ≤ 5 . Find functions 𝑓 and 𝑔 defined for 1 ≤ 𝑡 ≤ 5 so that 𝑥 = 𝑓 ( 𝑡 ) , 𝑦 = 𝑔 ( 𝑡 ) parameterizes the given path from 𝐴 to 𝐶 . Let 𝐴 = ( 1 , 1 ) and 𝐵 = ( 1 , 3 ) . Which of the following is a parameterization of 𝐴 𝐵 over 0 ≤ 𝑡 ≤ 1 that starts at 𝐴 and ends at 𝐵 . Let 𝐴 = ( 1 , 1 ) and 𝐵 = ( 1 , 2 ) . Which of the following is a parameterization of 𝐴 𝐵 over 0 ≤ 𝑡 ≤ 1 that starts at 𝐵 and ends at 𝐴 . Find the parameterization 𝑥 = 𝑓 ( 𝑡 ) , 𝑦 = 𝑔 ( 𝑡 ) of the path 𝐴 , 𝐵 , 𝐶 , 𝐷 using the interval 1 ≤ 𝑡 ≤ 9 . Let 𝐴 = ( 1 , 1 ) and 𝐵 = ( 1 , 2 ) . Find the parameterization of 𝐴 𝐵 over 0 ≤ 𝑡 ≤ 1 that starts at 𝐴 and ends at 𝐵 . A cube with side 3 sits with a vertex at the origin and three sides along the positive axes. Find the parametric equations of the main diagonal from the origin. True or False: There is only one way to parameterize the line segment from ( 1 , 2 ) to ( 3 , − 1 ) . 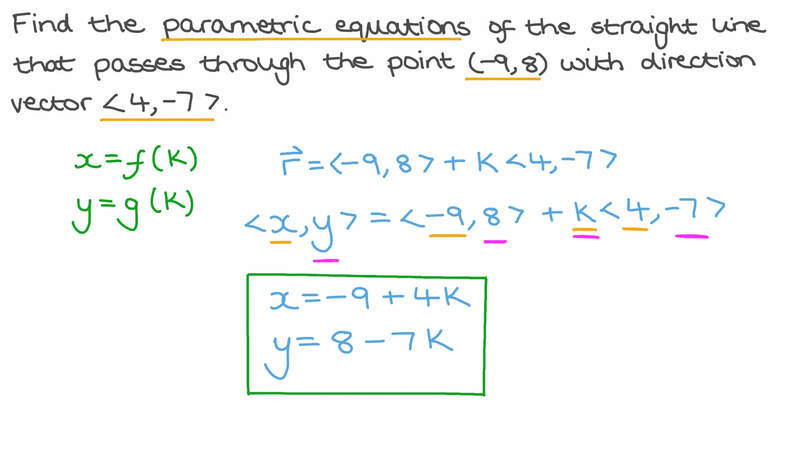 Find the parametric equations of the straight line that passes through the point ( 9 , − 7 ) with direction vector ( 3 , 2 ) .